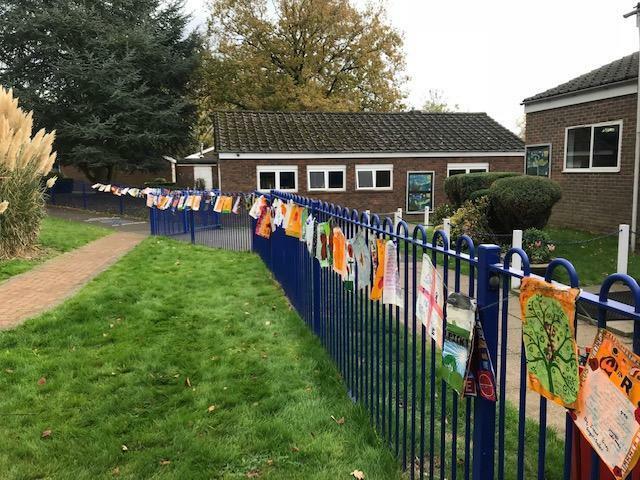 As part of our commemoration of the ending of WW1, the whole school took part in a prayer flag project led by Mrs Habgood. In the tradition of Himalayan prayer flags and combining this with the message of reducing plastic waste, each child created their own flag. This was made from used plastic with an added personal message that might have been related to a memory of a family member, a thank you to those who fought for freedom or a wish for the future health of our planet. The flags were bright and eye-catching and hung outside around the school for a few weeks until the weather "set the messages free"! We hope that the project has helped the children to realise the significance of the centenary and the role they have in preserving the planet for future generations.